42 Rules for Sourcing and Manufacturing in China - provides valuable insights from real executives and experts. For business people who are experienced in doing business in China, or for first-time visitors, this book will provide valuable insights from real executives and experts. These executives offer their personal experiences and recommendations about sourcing and manufacturing in China. Through over 20 extraordinary executive interviews, Rosemary Coates captured the essence of sourcing and manufacturing in China. 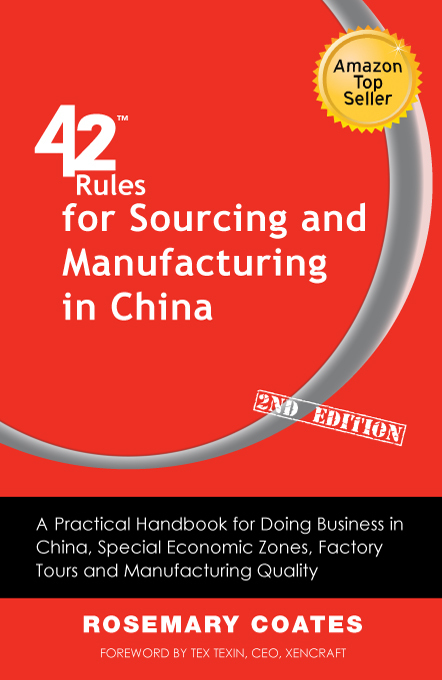 '42 Rules for Sourcing and Manufacturing in China (2nd Edition)' is a pragmatic approach that every businessperson headed to China must read. Doing business in China is tougher than you think. Not only is the culture vastly different, but China�s experience in manufacturing is still developing. It will be a few years before the majority of manufacturers are up to world standards. In the meantime, quality, contract laws, schedules and logistics must be closely monitored. As a result, the things Westerners must do to be successful are far different from dealing with American or European manufacturers. The best way to quickly come up to speed on these differences and how to handle them is to learn from the experience of others. Based on her 25 years of supply chain experience, much of it spent living and working across Asia, Rosemary Coates has become an expert on doing business in China. Her own personal experiences in China are interwoven into this book. Want a branded edition of 42 Rules for Sourcing and Manufacturing in China? "Rosemary Coates' 42 Rules will help you navigate the shoals of doing business in China. Her practical and accessible advice ranges from the value of guanxi (networking) to the importance of using a virtual private network for communicating with your colleagues. She realistically outlines the cross-cultural challenges of differing views on topics as diverse as wages, intellectual property protection, and subcontracting. It should prove a valuable introduction to anyone contemplating outsourcing to China." Donald A. DePalma, PhD, Author of 'Business Without Borders' and Chief Research Officer at Common Sense Advisory, Inc.
"As someone who has traveled internationally for decades, this book offers the ultimate antidote for faux paus. Ms. Coates' diligent research provides valuable guidance to anyone interested in doing business in China." "Rule 43: For any person or company doing business in China, thinking about doing business in China, or even planning a non-business tour, Rosemary Coates' 42 Rules for Sourcing and Manufacturing in China should be required reading. It is concise, accurate, and perceptive and provides a superb primer on this fascinating, confusing, and eternally dynamic country that will lead the world in the 21st century." Rosemary Coates is the President of Blue Silk Consulting. She is a seasoned executive with an MBA, 20 years experience in Supply Chain Management, Project Management and Systems Consulting. Prior to BSC, she was a Senior Director at SAP, the Supply Chain Practice Leader at KPMG Peat Marwick and at Answerthink, and a Regional Manager at Hewlett-Packard. Her philosophy includes a fully integrated approach to process and enabling technologies. Ms. Coates has consulted with global and domestic clients, VC�s and PE firms on systems and processes. She has considerable international experience and has worked for extended periods in Asia and Europe. Her experience spans a broad range of industries including High Technology, Software, Chemicals, Health Care, Consumer Products, Industrial Products, Food Distribution, Transportation, Publishing, Retail, Oil and Gas. She has extensive knowledge and experience in manufacturing and outsourcing in China.